The roots of growing plants need soil with good aeration, proper drainage and available nutrients. Peat moss is a soil amendment that helps improve soil structure by breaking up compacted soil into aggregates. Air is then able to diffuse into the soil, water is able to drain and nutrients are held in the soil clusters for when they are needed rather than being washed away. Peat moss can be used to prepare soil for flowers, help build a lawn, prepare a vegetable garden and provide a component in homemade potting mixes for container plants. Both annual and perennial flowers need soil that is well-drained and able to hold nutrients. Several weeks before flowers are planted, lay a 2- to 3-inch layer of peat moss and then work it into the top 8 inches of soil. 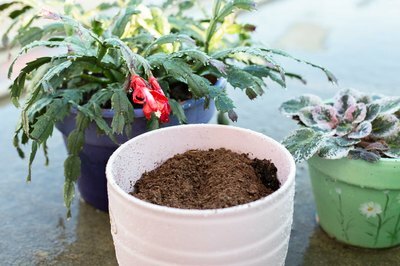 For flowers and plants that grow well in acidic soils, increase the amount of peat moss to create a mixture that is half peat moss and half soil, then cover with 2 inches of soil. 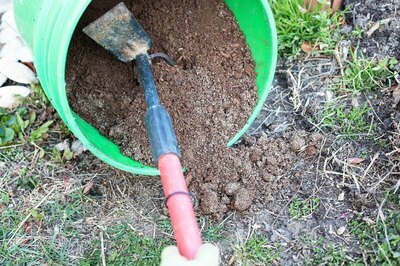 When preparing the soil for a new lawn, spread a 2-inch layer of peat moss and then work it into the top 6 inches of soil before distributing seed. Peat moss can also help improve bare spots in an existing lawn. Remove the top 2 inches of soil at the bare spot and discard. Then loosen the next 6 inches of soil. Add a 2-inch layer of peat moss and work it into the soil. Reseed the bare spot and top with a thin, 1/4-inch layer of peat moss to keep the seeds moist. In Autumn, till the soil down 8 to 12 inches deep. Add a 1-inch layer of peat moss and work it into the top 4 inches of the soil. 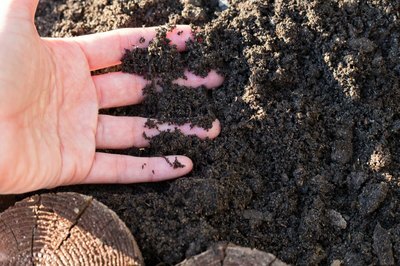 If the soil is still loose and easily runs through your fingers, add more peat moss to create larger aggregates. 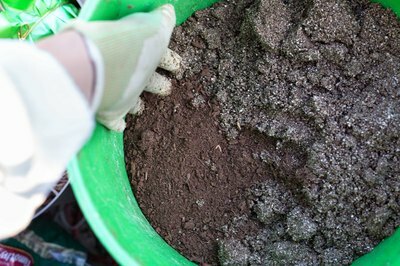 If the soil is predominantly large clumps of clay, more peat moss may be needed to break the clay into smaller pieces. Measure the pH of the soil after the peat moss has been added. If the peat moss has lowered the pH of the soil beyond 5.5, add lime to raise the pH back up to around 6. Potting mixes are coarser than normal garden soil and are often mixed together without any soil component at all. Peat-based mixes are good for seed germination because they are lightweight, sterile and have no weed seeds. 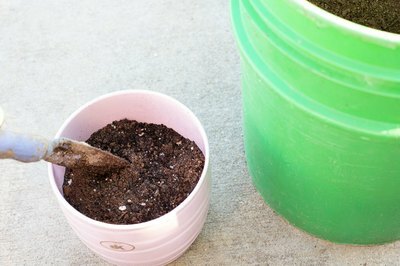 Combine a half-and-half mixture of peat moss and either perlite or vermiculite. Add 1/2 teaspoon of fertilizer per gallon of this soil-less potting mix and adjust the pH of the mixture back to 6 with lime. Moisten the mixture before using it for planting.